Bailey Larson is a forward from Sycamore, Illinois, playing for Colgate University. Before Colgate, Larson played high school hockey for Belvidere North High School and club hockey for Chicago Mission. With the Chicago Mission, Larson was a two-time captain and led her team to multiple championships including the Nike Bauer Championship, Stoney Creek Championship, Illinois State Championship, and Central District Championship. In 2015, Larson’s team won the USA National Championship to cap off a successful club hockey career. As a freshman, Larson launched herself onto the college hockey scene as she led Colgate in assists and points. Overall, she had 10 goals, 22 assists, and 32 points. Larson was named ECAC Hockey Rookie of the Week early in the season in October. At the end of the year, Colgate awarded her with her efforts as she was named the Colgate Women’s Hockey Rookie of the Year and the Colgate Athletics Rookie of the Year. Academically, Larson was also named to the Raider Academic Honor Roll. The next year, Larson continued to lead Colgate in top statistical categories. She led the Raiders in goals with 14 and added 13 assists for a total of 27 points. Once again, she was named to the Raider Academic Honor Roll for her work in the classroom. Additionally, she was named an ACHA All-American Scholar. Last year, Larson produced a career high in points as a junior. Her 11 goals and 22 assists added up to 33 points, one more than her freshman year output. Her solid play helped Colgate get to the National Championship. In the NCAA Quarterfinal, Larson scored to help lead the Raiders to their first-ever Frozen Four appearance. For the third consecutive year, Larson also garnered academic recognition with a spot on the Raider Academic Honor Roll. Larson has been off to a solid season thus far as a senior with 18 points in 24 games, good for a 0.75 points-per-game average. She was drafted 10th overall by the Boston Pride in the NWHL draft this past December and will graduate from Colgate at the end of the year with a degree in Educational Studies. Schammel recorded four points in two games against WCHA opponent Wisconsin over the weekend. In a 2-1 loss on Friday, Schammel scored Minnesota’s lone goal of the game and put up a team-leading five shots on net. Schammel then led Minnesota to a 3-1 win on Saturday with two goals and one assist. She factored into each of Minnesota’s goals and scored the game-winner midway through the second period. Wittig had five points through three games this past week. Most of her points came in a midweek game versus Ausberg on Tuesday. In a 7-2 victory, Wittig recorded two goals and two assists. Her second goal came on the power play and stood as the game-winner. Later in the week, on Friday, Wittig added another goal to her season total in a 4-1 win over UW Superior. Additionally, Wittig had three shots on net and a plus-one rating. Gabel put up an impressive five points in two Clarkson wins this past weekend. In Friday’s 5-1 victory over Yale, Gabel had one goal, one assist, nine shots on goal, and a plus-three rating. Her game-opening goal came just eight seconds into the first period. Gabel continued her imposing play with two goals and one assist during Saturday’s 6-0 win against Brown. She assisted on the first goal and then added two of her own to add to Clarkson’s mounting lead. Additionally, Gabel had a team-leading ten shots on net and a plus-three rating. In last week’s must-see matchup between Wisconsin and Minnesota, the two WCHA teams split two very close games in a weekend series. On Friday, Wisconsin won 2-1. Emily Clark, a Boston Pride draft pick, scored the opening goal five minutes into the game to give Wisconsin an early lead. Annie Pankowski, a Metropolitan Riveters draft pick, recorded the secondary assist on the goal. Just 18 seconds into the second period, Nicole Schammel, a Buffalo Beauts draft pick, scored for Minnesota to tie up the game. Wisconsin ended up scoring later in the second period and held on for the 2-1 win. Minnesota sought revenge on Saturday in a 3-1 win. Schammel led the team as she factored in on every Minnesota goal with two goals and one assist. After garnering a 2-0 lead in the middle of the second period, Minnesota conceded a goal to Wisconsin just 21 seconds after their second goal. However, they regained a two-goal lead in the third period and stayed strong for the win. For this week’s must-see matchup, we will move over to the CHA where there is a weekend series between RIT and Robert Morris. These two games will feature the only two NWHL draft picks in the CHA conference. On RIT, Kendall Cornine, a Metropolitan Riveters draft pick, has been leading the charge offensively. 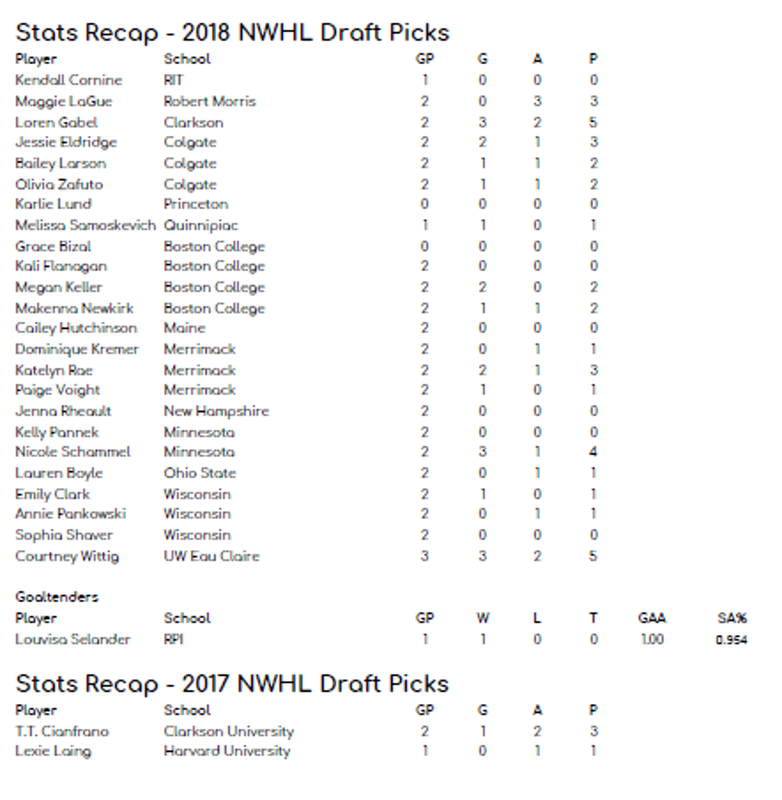 Meanwhile, Maggie LaGue of Robert Morris was drafted by the Connecticut Whale and has been a leading force on defense this season. The two teams square off at 7:05 PM on Friday, Jan. 25 and at 3:05 PM on Saturday Jan. 26.